March was Reading Ireland month, hosted by Cathy at 746Books. I was hoping to read at least one book by an Irish author that month, but it didn’t happen. So, now, here are two. Better late than never, right Cathy? When I read that Academy Street was Kim’s book of the year on her blog Reading Matters, I put a hold on it at the library. 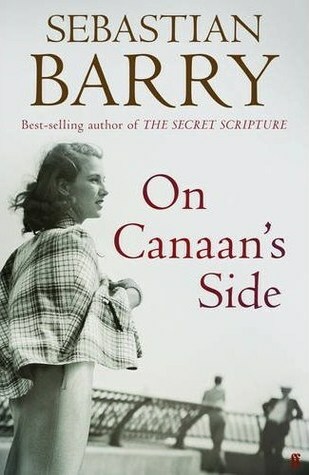 More recently, my sister recommended On Canaan’s Side, and since I hadn’t read anything yet by Sebastian Barry, I requested it right away. They both came in at once, so I ended up reading them back-to-back, which turned out to be a funny coincidence. As I read the books, I started noticing similarites between them. Both are about Irish women, from childhood until retirement or old age. Both women came to America from Ireland when they were still very young. Both had been raised without a mother. Both end up cut off from most of their relatives for much of their lives. Both had short relationships/affairs/marriages. Both were single mothers with one son. Both had to deal with the loss of their sons (and in one case, grandson). At the same time, they are very different stories. Academy Street is written in third person, so it feels different from On Canaan’s Side, which is written in first person. It also has a more melancholy tone. The character of Tess (Academy Street) was more of a solitary person than Lilly (On Canaan’s Side). She spent her life longing to fit in somewhere. Tess worked as a nurse, and seemed to get a lot of satisfaction from that, and she had one good friend over the years. Lilly was a more optimistic person, and although she didn’t have it easy, she was always able to pull out of her troubles and move on. Her life was helped along by kind people, who Lilly felt very grateful for. Over the years, she enjoyed the friendship of several people, as well as two short relationships, one that ends tragically, and one that ends mysteriously. While Tess spends her life aching to belong, Lilly spends her life in fear; at first, fear for her own life; then, later, fear for her son and grandson who end up fighting in two different wars. We read about Tess’s life from childhood to retirement, as she experiences it. When we first meet Lilly, she is 89 and has decided to write about her life before she dies (calling it her confession). So, Lilly’s story goes back and forth in time over the course of the 17 days that it takes her to write her story. The style reminded me of The Stone Angel – but with a lot more gratitude involved. Lilly is easier to like than Hagar. Two different styles of writing, but both books are well written, and easy to read and enjoy. I recommend them both, but maybe don’t read them at the same time. You might end up getting a little confused between them, like I did. 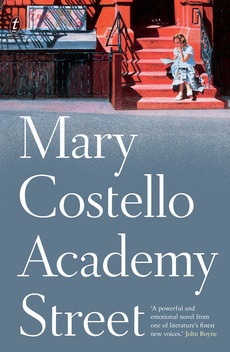 NYT review of Academy Street. These quotes will give you a good idea of what Tess’s character is like. She danced with every man who asked her, not because she wished to, but because she sensed something of the dread that these hopeful anxious men had endured just to ask, and the awful humiliation they would suffer if she refused. There was, in her nature, a certain passivity, an acquiescence that was ill-suited to change or transformation, as if she feared ruffling fate or rousing to anger some capricious creature that lay sleeping at the bottom of her soul. It seemed at times that she was marooned on an island, a moat of water, wide and black, separating her from all human love. The worst thing had finally happened, the calamity she had always been waiting for. It was almost a relief when it arrived and the waiting was over. She had been too happy. Such happiness carries danger at its heart, the seed of its own demise. She started to see possibilities everywhere, and it was this feeling of possibility – even if she did not always avail herself of it – this vibrancy and passion that were essential to life. On books: Over the years, over long winter nights, Tess found a new life in books… Another vocation then, reading, akin even to falling in love, she thought, stirring as it did, the kind of strong emotions and extreme feelings she desired, feelings of innocence and longing that returned her to those vaguely perfect states she had experienced as a child… She became herself, her most true self, in those hours among books. As I was reading Kim’s review of Academy Street, I realized that she had also read On Canaan’s Side, and has compared the two. So, of course, I had to follow the thread, which led me to find out (through Kim) that a couple of Barry’s other books involve Lilly’s sister and brother (Annie Dunne and A Long Long Way). Also, that Sebastian Barry has used his family’s history to write about in his books. Unfortunately, this has led to me having to add several more books to my to-read list. NYT review of On Canaan’s Side. What is the sound of an eighty-nine-year-old heart breaking? But the feeling of it is like a landscape engulfed in flood water in the pitch darkness, and everything, hearth and byre, animal and human, terrified and threatened. It is as if someone, some great agency, some CIA of the heavens, knew well the little mechanism that I am, and how it is wrapped and fixed, and has the booklet or manual to undo me, and cog by cog and wire by wire is doing so, with no intention ever to put me back together again, and indifferent to the fact that all my pieces are being thrown down and lost. I am so terrified by grief that there is solace in nothing. I carry in my skull a sort of molten sphere instead of a brain, and I am burning there, with horror, and misery. I am cold, even though the heat of early summer is adequate. I am cold because I cannot find my heart. There’s no point talking about love, what’s sure as sure is no human person knows what that is. Fear is a force like seasickness, could you call it a life-sickness, a terrible nausea caused by dread, creeping dread, that seems to withdraw a little in dreams while you sleep, but then, just a few moments after waking, rushes back close to you, and begins again to gnaw at your simple requirement for human peace. Gnawing, gnawing, with long ratlike teeth. No one can live through that without changing. We may be immune to typhoid, tetanus, chicken-pox, diphtheria, but never memory. There is no inoculation against that. To remember sometimes is a great sorrow, but when the remembering has been done, there comes afterwards a very curious peacefulness. Because you have planted your flag on the summit of sorrow. You have climbed it. And I notice again in the writing of this confession that there is nothing called long-ago after all. When things are summoned up, it is all present time, pure and simple. So that, much to my surprise, people I have loved are allowed to live again. Have you ever read two similar books back-to-back completely by accident? Maybe on purpose? Read any good Irish books lately? I love, LOVE Sebastian Barry and I nearly read this one for Reading Ireland Month. The Secret Scripture is just the most beautiful book. I’ll definitely read On Canaan’s Side next year. I have already asked for Academy Street for my birthday (in November!) as everything I read both from it and about it is just marvellous. Thanks for joining in, better late than never for sure! I just picked up The Secret Scripture at a book sale this weekend! I probably wouldn’t have even noticed it if I hadn’t just read this one. Now, I’m really looking forward to it. The other ones Kim reviewed on her blog also sound good – he must just be one of those go-to authors. Look forward to hearing what you think of The Secret Scripture. I think all his books are linked in some way – a lot of the characters appear in other books, but I don’t think it’s necessary to read them in any order. The Secret Scripture is being made into a movie with Eric Bana and Vanessa Redgrave – looking forward to that! A good reason to read it sooner rather than later! I love the way you’ve compared and contrasted these two novels, it makes very interesting reading. I liked Academy Street very much, the focus on a reserved life, the deeply melancholy tone. Sebastian Barry is one of those authors I’ve yet to read, but I’m sure I would appreciate his prose style. I knew there was another review of Academy Street that I had read – it must have been yours! It was fun comparing them, but I feel like I didn’t really get to talk about either of them in very much depth (besides all the quotes – I couldn’t leave those out!). Good thing there are lots of other good reviews around to link to! I didn’t realize Sebastian Barry was Irish. Maybe that’s because I’ve never read him! But I’m looking very forward to Academy Street. I hadn’t even heard of him before my sister recommended the book to me. So, I’m glad I read it – now I know! I loved Academy Street when I read it last month. I’m still trying to write a review that does it justice… It is such a beautiful, melancholy book. I’ll have to check out Sebastian Barry. I might have seen his name floating around, but I never read anything by him. But it sounds like he’s well worth a try. I’ll watch for your review – I feel like mine doesn’t do it justice because I wrote about both books together. But, I also knew there were already some pretty great reviews about it around. 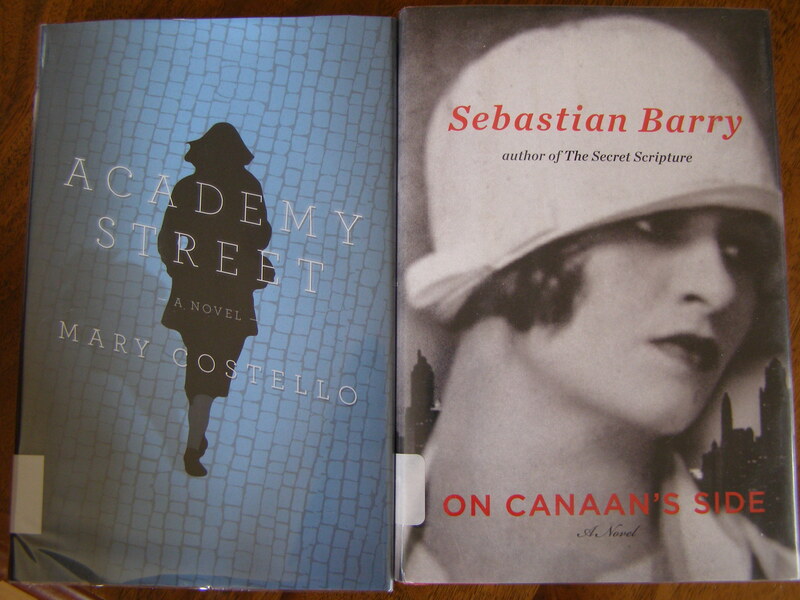 Sebastian Barry is also worth checking out! It is quite interesting when you read books in sequence, sometimes the similarities just jump out at you! I like your review of these two, though I don’t believe I’ll place them on my TBR, at least I have an idea about them now! If you visit Cathy’s blog, you’ll find a list of 100 Irish writers – so many good ones to choose from! I read both these books and loved and adored both of them too. But I read them many years apart so I didn’t make the comparison between the two at all. I did make more of a comparison I think to “Nora Webster” – Academy Street was done far better than Nora Webster. And I have a genuine love and affection for Lilly! I’m sure I wouldn’t have noticed the similarities between the two of them if I hadn’t read them back-to-back. Because, really, they are very different stories with different writing styles and tones. Lilly had it rough – I wanted so badly to go in and change things for her!